Rider pride was in full swing as the Royal Canadian Mint launched a new commemorative one-dollar circulation coin honouring the Saskatchewan Roughriders’ 100th birthday. The Mint delighted Roughrider fans by officially unveiling this circulation coin in the company of Saskatchewan Roughriders and federal government officials gathered at a public event held in Regina’s Northgate Mall. "The Roughriders and their legendary fan base have been part of Saskatchewan culture for a century and the Royal Canadian Mint is proud to commemorate their special place in Canadian sports history through this new one-dollar circulation coin," said Ian E. Bennett, President and CEO of the Royal Canadian Mint. "Each of the three million 2010 Saskatchewan Roughriders Centennial one-dollar coins entering circulation today will be a permanent tribute to the incredible spirit and pride of generations of Roughrider fans." "The Saskatchewan Roughriders are icons of Canadian football and the Government of Canada is proud to join Canadians in celebrating their 100th anniversary," said the Honourable Rob Merrifield, Minister of State (Transport). "This new coin produced by the Mint has immortalized an important milestone in Canadian sports history which Rider fans and Canadian football enthusiasts alike can cherish for years to come," said Andrew Scheer, Member of Parliament for Regina-Qu’Appelle. "This circulation coin is a tremendous honour for the Saskatchewan Roughriders and a unique opportunity for our fans across the country to show their Rider pride," stated Riders President and CEO Jim Hopson. "We are extremely grateful to the Royal Canadian Mint for producing the Rider Centennial Loonie and leaving a lasting legacy across Canada." This finely crafted circulation coin, whose reverse is engraved with the Saskatchewan Roughriders’ logo and a stylized ‘100’ framed by the dates 1910 and 2010, commemorates the traditions and passion which have supported the team for generations. The Mint has produced three million of these one-dollar commemorative circulation coins which Canadians can now find in their change, or order online (while supplies last) by visiting mint.ca/roughriders. 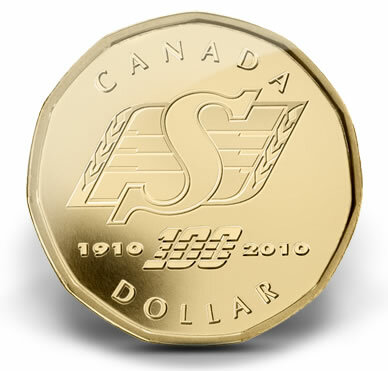 The Mint has also crafted a gold-plated version of this circulation coin to offer Rider fans and coin collectors. The coin is presented in a visually striking "pop-up" folder duplicating an official 2010 Roughriders football helmet. Available while supplies last, this special-edition coin and holder retail for $19.95 CAD and can be purchased by calling 1-800-267-1871, online at www.mint.ca, or by visiting the Mint’s boutiques in Ottawa and Winnipeg. It is also available through the Mint’s world wide dealer and distributor network. The Royal Canadian Mint is also excited to host an online contest to find the ultimate Saskatchewan Roughriders fan. Those dreaming to get the call to be the Roughriders’ "13th Man" are invited to submit a video or picture capturing their "Rider Pride" to www.roughriders.mint.ca. The entry with the most votes will win an ultimate fan package consisting of a pair of tickets to this year’s celebrated championship game in Edmonton, Alberta, as well as travel and accommodations.